← Spanish football: It doesn´t get any bigger than this! 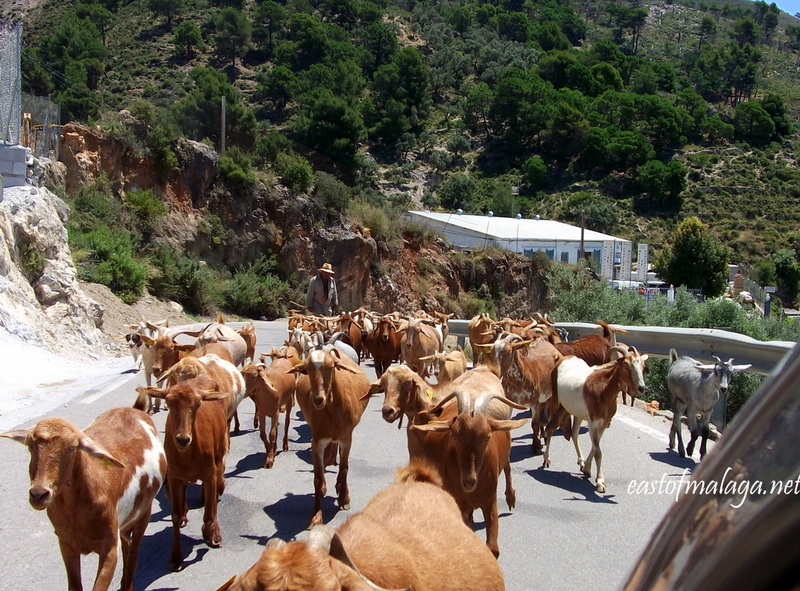 One of the unexpected delights of living east of Málaga, is coming across herds of goats whilst negotiating the picturesque, curvy mountain roads. The beauty and tranquility of the local landscape is enough to lift the spirits, even on the greyest of days, especially when you come face to face with a herd of ninety goats meandering along the road. I love meeting the goats and always wind down my car window to say “hola” and pass the time of day with the goatherd, as well as telling the goats what good girls they are! It´s amazing how even though some of the goats climb up the rocks above the road to nibble at whatever plants take their fancy, and some stray perilously close to the edge, they all stay pretty much together. I dread to think how many would be left in the herd if I was in charge of them! 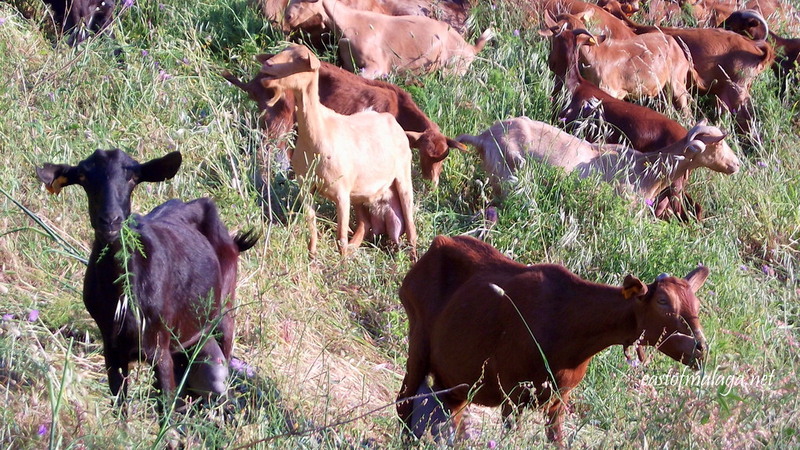 The sight of a herd of goats never fails to make me smile – no matter how often I see them! This entry was tagged Andalucía, Cómpeta, culture, East of Malaga, Europe, life, lifestyle, Malaga, photography, Post a week, Spain, travel, Travel theme, Weekly Photo challenge, white villages. Bookmark the permalink. much more charming than snakes on a plane……. Pingback: Cost of Living: East of Málaga, Spain – April 2013 | East of Málaga .... and more! Wow, you really weren’t “kidding”, were you! How awesome. Nice pages Marianne and great pics, Competa was almost our home once, great village. Was amongst the wonderful Goats a few weeks ago, can still smell them…Ahhh lovely !! Thanks for letting me know, Bob. Unmistakable odour – once experienced, never forgotten! Goat cheese is yummy – the milk not so much. Great photos. I won’t be frustrated getting stuck in a “traffic”, when the ones blocking the way are animals like goats, elk and cows. Awesome post! the goats look healthy and happy! These are fabulous – love them all! I love goats!! They have such funny personalities. My mom had quite a few that we just adored. They are so cute! Can I keep some? I think so…while I’m at it, I also want a piggy wig wig – because they’re also cute and no, I won’t call it Bacon. Oh what pretty animals they are. I didn’t use to think so, but your photos of them make them look happy. I love the brown and white ones in the first photo. Thanks for visiting my blog. I’ve always thought goats are so adorable. I would love to see them wandering through the streets of London. I am more likely to come across the goats at the end of the day as they are on their way back home (or I am! ), so they are usually ready for milking. I always feel sorry for the girl at the back of the herd who is having the most difficulty walking because of that predicament …… awwwww! Goats are my fav animal. I would like to know what the last one is saying. This too is a common sight where we live and I love it when I have visitors and they remind me to look at them through different eyes! What beautiful creatures and what a lovely part of the world you live in. You are surely blessed. Have a wonderful day. I’ve been fortunate to drive around parts of Europe and these little surprises are what made the trips memorable. If I wanted to “keep on schedule” I would have stayed on the highway. I love goats, they are so cute in an annoying kind of way. I saw a few wild mountain goats when I was hiking in the mountains around Madrid this past spring. I love the way they can climb up onto the narrowest of ledges and still not fall off! Oh they are lovely and your photos are fantastic. In NZ we have sheep on our roads and I love seeing them -;)! Glad I could remind you of your Norway trip – it´s good to be reminded of things that make you smile. They have to keep their wits about them, or they get covered in almond sauce and eaten! I like it to draw goats but I must go in the zoo or to a landhouse to do that in Berlin! This is lovely! What is for you a commonplace occurrence seems completely exotic to me. There is such value in sharing the everyday on our blogs. I totally agree, Sally. Goats on the road was pretty exotic to me before I came to live in southern Spain, too! I live at the end of a camino that leads to the river. Not only do I find myself hemmed in by the goats on the camino frequently (and usually when I’m in a hurry, natch), but also I often have them ranged along my perimeter fencing, with the dogs all going mental at them and the goats just chewing the cud, unperturbed, right back. Awww, I love the goats too! And love your play on words: “kid you not!” We have herds of long-haired goats everywhere in Oman too. Some of them stand on their hind legs to eat the leaves out of the trees. That always makes me smile! Thanks for your lovely comment, Giana.